Gorgeous Gummi Bear Chandelier. Yummy! – ¿¡ tjongolongo ?! 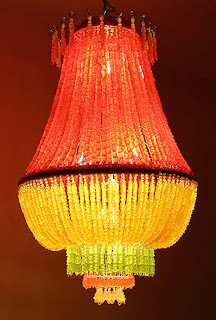 This chandelier made out of many gummi bear sweets is part of a project by Ya Ya Chou. According to her website Ya Ya Chou decided to “explore the relationship between food consumption and class” and one of the things that came out of that was the chandelier. Tjongolongo, what will they think of next! 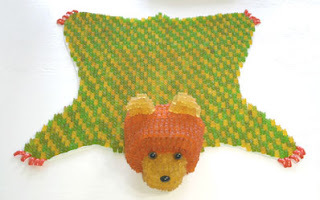 Well… apparently, a rug made out of gummi bears is also something she came up with! I like it though, but I do wonder how long it will take before you start eating the chandelier! Ever seen a fish finger swim? Pingback: Ever seen a sculpture made from cardboard? — ¿¡ tjongolongo ? !